The "pin-wheel" from which these calculators take their name is a circular disc or wheel which has nine retractable pins extending radially around part of its circumference. The pins can be extended or retracted by a setting mechanism, which is generally operated by rotary levers. The pin-wheels and setting rings are assembled into a "rotor" or cylinder, which rotates forward or backward as the handle is turned. 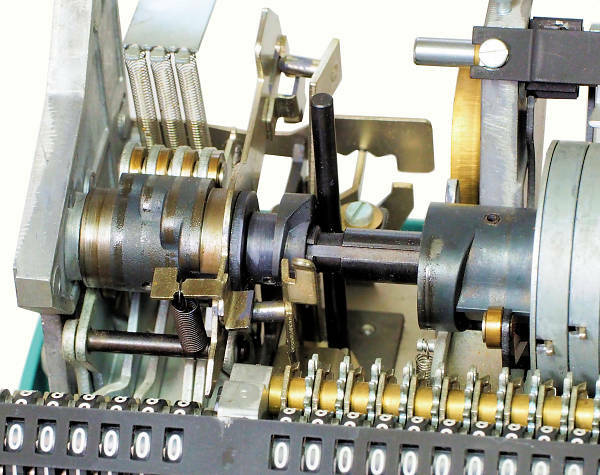 The extended pins act as gear teeth to advance a register by the corresponding number of places. The wheel in the illustration shows five pins extended on the left-hand side. (The two pins on the right are part of the tens-carry mechanism). The concept of a variable-toothed gear was known to Leibnitz in the 1600s. An early form of pinwheel was used in machines such as the cylindrical Roth calculator from 1841, but these machines were never produced in quantity. 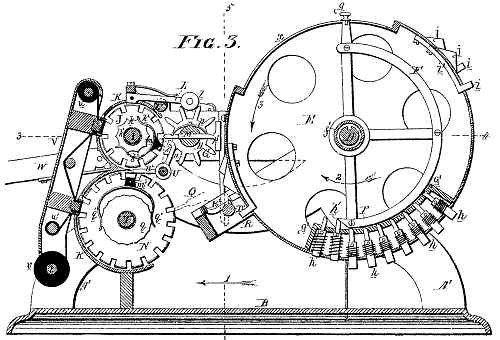 The modern form of the pin-wheel calculator dates from the early 1870s, when similar machines were developed more or less simultaneously by Frank Baldwin in America and Willgodt Odhner, a Swede living in Russia. Baldwin's machine was developed during 1872 and 73, and was sold and used commercially from 1874. 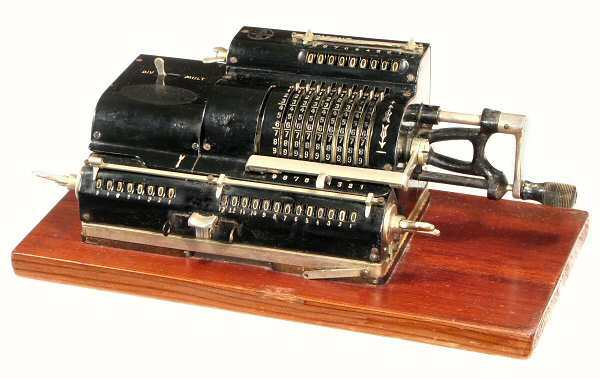 It is generally acknowledged as the first practical pinwheel calculator, although it is often called the "Baldwin 1875" machine after the year in which it was granted its US Patent (No. 159244). 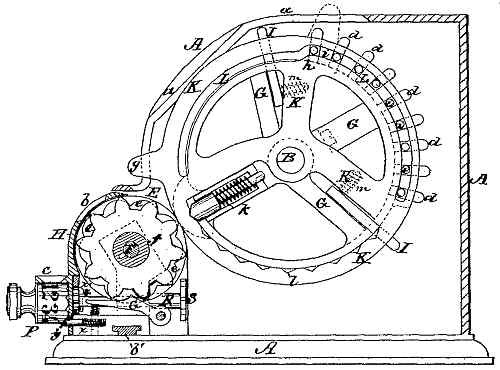 The illustration (from the patent drawings) shows a cross-section of the machine, with the setting lever at the top and the pins extended at the lower right. The arrangement at the left-hand side is a printing mechanism to take an impression of the raised numerals on the register wheels. Baldwin was a prolific inventor who continued to develop many and varied calculator mechanisms (including that for the Monroe line) until his death at 87 in 1925. Odhner's machine was developed in St. Petersburg from about 1874. This illustration from his US Patent (No. 209416) of 1878 shows a pinned disk and setting mechanism that is directly comparable to the modern version shown above. Odhner's design had the greater commercial success, and it was his name that became more generally associated with the pinwheel mechanism. By about 1890 (US Patent 514725) the Odhner calculator had developed into the form which was to endure more or less unchanged for the next eighty years. In 1892 the patent rights were sold to a firm in Germany, who developed a very successful line of machines under the name "Brunsviga". Similar machines soon appeared from many other manufacturers. After the Russian revolution in 1917, Odhner's heirs re-established the company in Goteborg, Sweden, under the brand name "Original-Odhner". The pin-wheel calculator was a simple and reliable machine, which was capable of all four arithmetic functions. Addition and subtraction were performed directly, while multiplication and division were accomplished by simple procedures involving repeated additions (or subtractions) and carriage shifts. 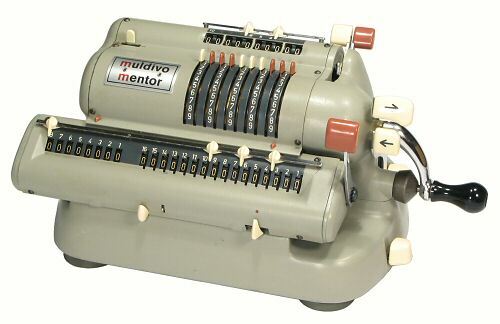 a wide carriage with 20 or more digits in the accumulator register, allowing the results of intermediate calculations to be stored at either end and retrieved via the back-transfer mechanism. Pin-wheel machines to Odhner's basic design were built (and copied, legally or otherwise) in many countries of the world. Those found in Australia were generally built in Europe or Japan. The machines were in continuous production for almost one hundred years, from their beginnings in the 1870s until overtaken by four-function electronic calculators in the 1970s. 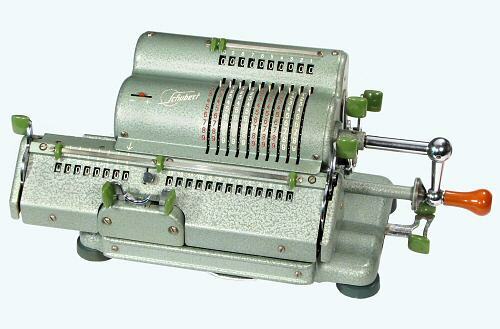 Follow the links to separate pages describing the pin-wheel calculators from Brunsviga, Original-Odhner, and Facit, or read on for some lesser-known machines from countries around the world. 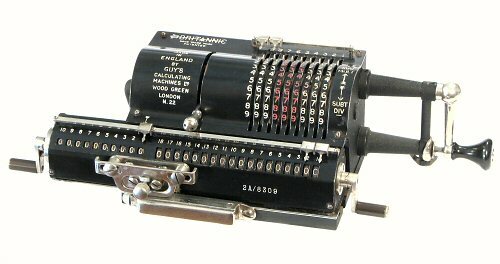 The Britannic Model 2A is a small and simple pinwheel calculator which was made in England by Guy's Calculating Machines of Wood Green, London. The body of the machine is built from three brass castings with sheet-metal top covers. Although the calculator itself is in very good condition, it is missing its original wooden base and cover. The rotor pinwheels are 48mm in diameter, with the setting rings spaced on 6.0mm centres (ie, the mechanism is built to metric dimensions). A rotor clearing lever is provided on the face of the machine, to the left of the setting rings. The carriage has an 18-digit accumulator, with tens-carry extending to 13 places. There is no tens-carry on the counter register. The carriage shift mechanism has a sliding bar which moves one place at a time in either direction, and a lever to allow continuous movement. 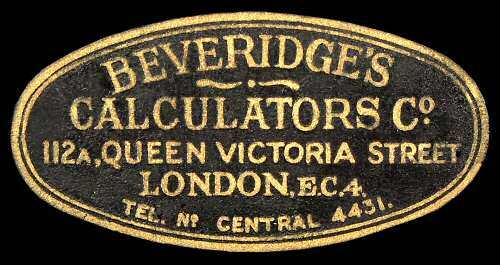 The Muldivo Calculating Machine Company was established in London in 1912. The company distributed the British-made Britannic machine (above), and acted as importers and agents for several European manufacturers. The "Muldivo Mentor" is a re-badged (post-war) machine from the Walther company in Germany. The Muldivo nameplate simply states "Foreign manufacture", but retains the Walther WSR-160 model number. Further details are available on the Walther page. Manufactured: for Chateau Bros, Paris, from 1905. This basic pinwheel calculator from the early 1900s is heavily built of cast iron and brass. It has only minor differences from the Brunsviga Model B machines of the same time. It was built in Jura for the Chateau Brothers of Paris, beginning in 1905, and was sold under several names including Chateau and Dactyle. The machine illustrated lacks the usual square nameplate on the left-hand side, but is identified by the "Sous" marking for subtraction and the French patent inscription "Bt� SGDG" (for "patented without government guarantee") under the serial number. It is said that the Marchant Brothers in America started their calculator business by importing and selling re-branded Dactyle machines. Serial number and patent notice. 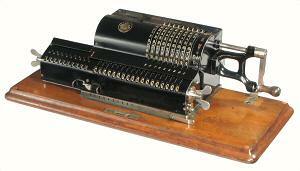 The Triumphator Works built pinwheel calculators at Leipzig in Germany from 1907. Their machines were very popular in Europe, but are rarely found in Australia. The machine illustrated was built around 1914, and was sold through a dealer in London (presumably just before the outbreak of war). This well-used machine has a check dial on the rotor and full tens-carry on both registers, but no back-transfer mechanism. The rotor is cleared by lifting the external bail across the front of the setting rings. The registers are cleared by a full turn of the wing nuts at either end. The carriage is positioned manually by pressing the tab at the front and moving it to the desired position. The extended section at the left of the machine contains the carry rotor and the reversing mechanism for the counter register. The counter is set manually for multiplication or division by the lever at the top left. The machine is very solidly constructed of cast iron and brass, and is mounted on a wooden base with an embossed sheet-metal cover. 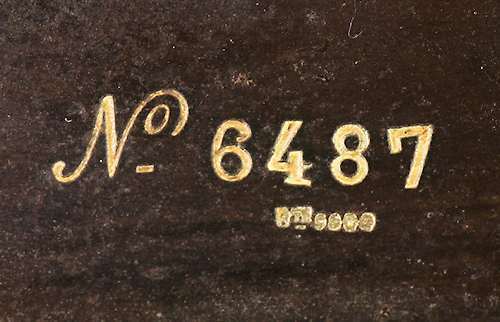 Dealer's label on rear panel (29kb). Emil Schubert (1883-1952) had worked for Triumphator in Leipzig before establishing his own company at Rastatt in Germany. 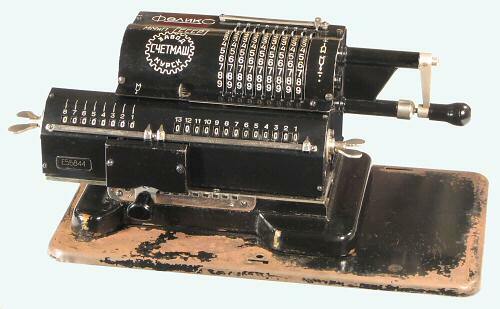 He built the Thales pinwheel calculator in several versions from 1911, and the Tasma add-list machine from 1924. The machine illustrated is a Thales Model A from about 1920. The Model A is a basic machine in 9x8x13 format. It is thought to be one of the first pinwheel machines to use a spring-loaded carriage, which steps automatically to the left when the tab at the front is pressed. Simultaneously pressing the small lever at the left-hand end allows the carriage to run fully to the left. It is returned manually by pressing the tab and pushing back on the finger plate at the left-hand end. The carriage position and the pinwheel rotor are interlocked so that neither will move unless the other is in a locked position. The rest of the Thales mechanism is very similar in principle and in detail to the Model A Brunsviga, but scaled to about 2/3 the size. The machine illustrated was received in very poor condition, and required major internal repairs to the registers and pinwheels. The case and numerals have been repainted, and a new wooden base fitted. The rotor decimal point indicator and quick-clearing bar are still missing. Rear view showing spring barrel and rotor interlock (29kb). 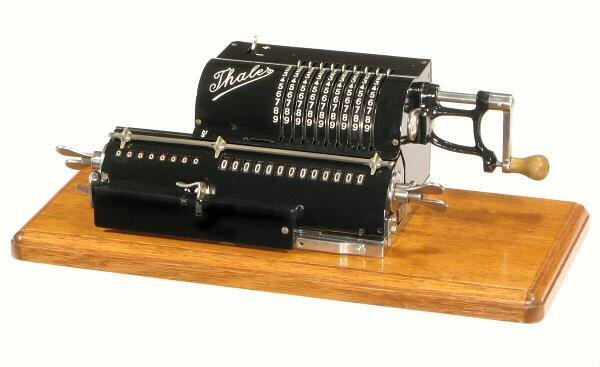 Emil Schubert (1883-1952) built the Thales pinwheel calculator (above) at Rastatt in Germany from 1911, and the Tasma add-list machine from 1924. Schubert lost control of the company in the early 1930s, but re-established a new business under his own name in 1938. Production of Schubert calculators resumed after the war, and continued until the late 1960s. The Schubert Model DRV was first introduced in 1953. This colourful version in metallic green hammertone is from the 1960s. The machine was designed to facilitate one-handed operation, with all of the controls located (or duplicated) on the right-hand side. The rotor has ten setting rings on 7mm centres, with a check dial above and a quick-clearing lever to the right. The carriage has separate clearing levers for each register. The right-hand lever normally clears both, but the coupling can be disconnected by pressing the small tab between the registers. The carriage shift levers at the front are replicated in the double-sided lever below the winding handle. The counter register has full tens transfer, with automatic reversing and manual override. The carry mechanism is unusual, in that it uses a simple odometer-style register with a powered "helper" mechanism to assist each dial over its detent. The machine has a back-transfer mechanism operated by the handle at the right-hand rear. The rotor clearing lever is pushed rearwards and held, then back-transfer lever is pulled forward and latches. The result is transferred as the accumulator is cleared. 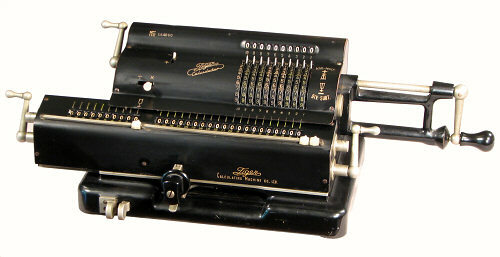 The Carl Walther company introduced a line of pinwheel calculators in 1924 to supplement their primary business in sporting firearms. Model RMKZ is built from aluminium-alloy castings and is (relatively) light in weight. It has a setting check dial and tens-carry on the counter, but no back-transfer mechanism. The carriage is spring-loaded towards the left, and is moved one step at a time by the two vertical levers next to the winding handle. A button at the front releases the detent to allow continuous movement. The accumulator register has small fibre thumbwheels next to each numeral wheel to allow values to be entered directly, eg, in setting up a division. The Walther factory in Zella-Mehlis was lost during the war, but calculator production resumed in 1948 at Niederstotzingen in West Germany. 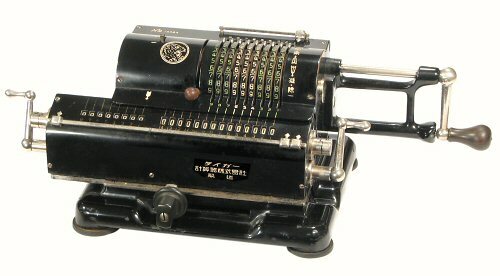 A new version of the Model RMKZ was the first post-war product, followed later by a range of ten-key printing calculators. Further details are available on the Walther page. 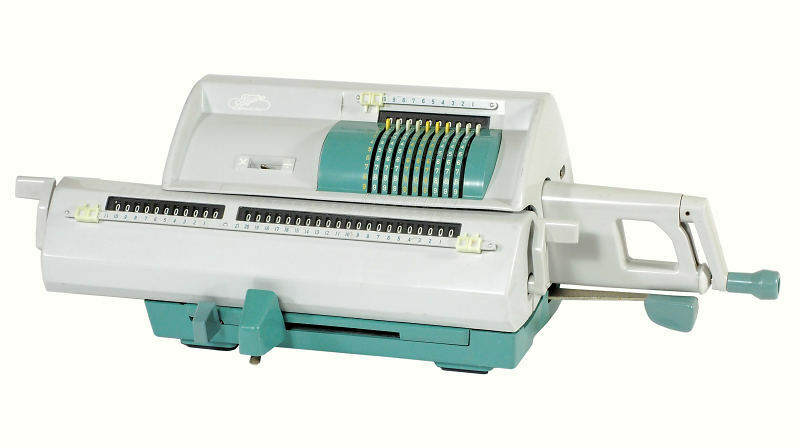 The Addo company of Malmo in Sweden produced a range of slide-set adding machines from 1920. These were replaced in 1927 by full-keyboard adding and listing machines. 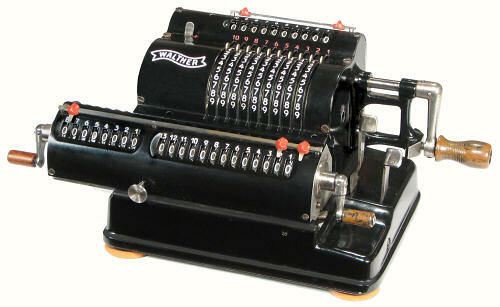 Ten-key machines were produced from 1936, and pin-wheel machines under the "Multo" brand from 1949. Addo/Multo was absorbed into the Advidaberg/Facit/Odhner group in 1966. The Addo name continued to appear on Odhner pinwheel machines until production ended around 1970. The Multo range was designed specifically for single-handed operation, with all of the controls located on the right-hand side. The Multo rotor has ten setting rings on 7mm centres, with a check dial above and a quick-clearing lever to the right. The carriage has only one clearing lever, which normally clears both registers. Pressing the adjacent tab disconnects the accumulator and clears only the counter (as in setting up a division). It is not possible to clear only the accumulator. The carriage is spring-loaded to the left, and is moved stepwise in either direction by the lever under the winding handle. A button on the front of the machine releases the carriage and returns it fully to the left. There is no tens-carry on the counter, and no back-transfer mechanism. This early machine carries only a serial number (3-8145), with no indication of a brand or manufacturer. Multo Model 113 is a full-featured version of the Model 3. It has a tens-carry mechanism with automatic reversing on the counter register, a back-transfer mechanism from the accumulator to the rotor, and an Addo/Multo badge at the top left. The back-transfer is operated by pressing the button to the right of the setting rings when the rotor clearing lever is pulled forward. A small red indicator appears at the right of the carriage when the back-transfer is engaged, and a lever below the indicator allows the mechanism to be released if the button was pressed accidentally. The carriage release button has been removed from the front of the machine and replaced with a rocking dome nut just inboard of the winding handle. The Technical Section on this site has an illustrated description of the Multo 113 mechanism, and a step-by-step procedure for rebuilding the machine. 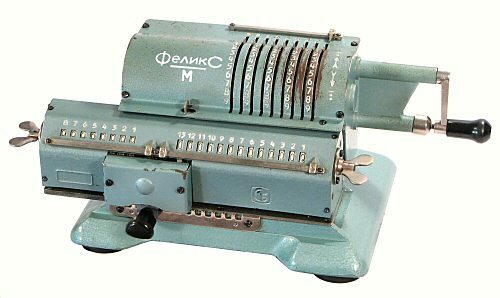 The "Felix" calculator is said to be named after Felix Dzerzhinsky, who established the Soviet calculator factory in Moscow in 1924, and later achieved fame as the founder of the KGB. 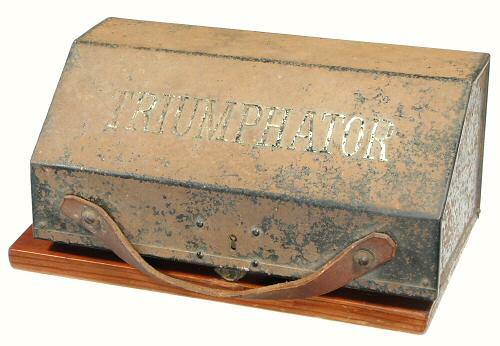 The machine illustrated has a cast-iron base and frame, with a sheet-metal carrying case. The mechanism and the internal construction are rather basic, but the machine is quite well-built and is still in good working order. 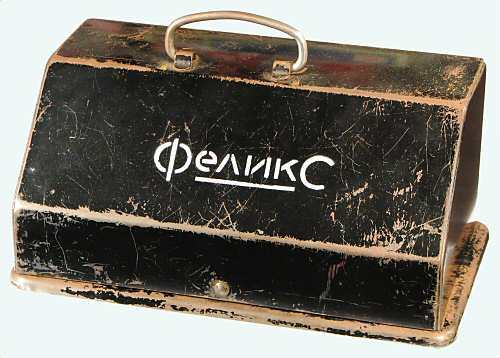 Felix in carry case (29kb). A later version of the Felix, using light-alloy castings and weighting only 3.6kg. The Tiger Calculating Machine Co. Ltd. of Osaka was established in 1923, and became the largest of the Japanese mechanical calculator companies. The machine illustrated dates from 1937. It is a conventional pinwheel machine, which is solidly built of cast iron and brass. The nine pinwheels are 49mm in diameter, with the setting levers spaced 6mm apart. A quick-clearing lever is located to the left of the setting levers. The accumulator has 14 places, but the tens-carry only extends to 13. There is no tens-carry on the counter register. The carriage shift and clearing mechanisms are similar to the Trinks Brunsviga. This Tiger machine dates from 1957, although the case design is largely unchanged from the 1930s. 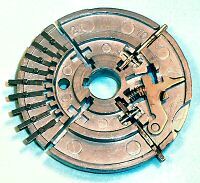 The mechanism uses a modified pinwheel with an extending gear segment instead of individual pins on the rotor, similar to that developed by Carl Friden at Marchant around 1920. The setting levers do not move as the rotor turns, but cause the gear segment to extend and retract at the appropriate times to advance the register by the required number of positions. The Tiger calculator is very solidly built. The mechanism includes a setting check dial and quick-clearing lever, a wide carriage with a 20-digit accumulator, and a back-transfer mechanism operated by the small handle at the front left-hand corner of the baseplate. The counter register has manual reversing for division, and an odometer-style tens-carry mechanism which extends only to four places. Model H68-21, first introduced in 1968, was the last of Tiger's mechanical calculators. Altogether, the company built almost half a million machines between 1923 and the closure of the calculator business in 1974. The present machine is nicely built with an attractive two-tone plastic casing, and is a kilogram lighter than the models above. The mechanism has a number of changes and improvements over the earlier models. It still uses Friden's extending-segment principle, but with the gear segments and setting levers made of plastic instead of metal. The lever to clear the pinwheel setting is now conveniently located next to the winding handle. The carriage registers each have one additional place, and the counter register now has automatic reversing and full tens-carry. The counter carry uses an odometer-style mechanism with a set of four cam-operated levers which riee in sequence to assist the dials into their detent positions. Internal view showing counter reversing and carry assist mechanisms. Busicom, or the Nippon Calculating Machine Corporation, was established in 1928 by former staff from the Tiger company. In 1969 Busicom commissioned a small American company called Intel to make a chipset for a new electronic calculator. Rather than designing a custom calculator chipset, Intel designed a general-purpose processor that could be programmed to act like a calculator, under the control of instructions stored in a read-only memory (ROM). Intel re-purchased the rights to the design, and the world's first microprocessor - the 4004 - was released to industry in 1971. Had the customer been a little more commercially astute, we might all have been using Busicom computers today! 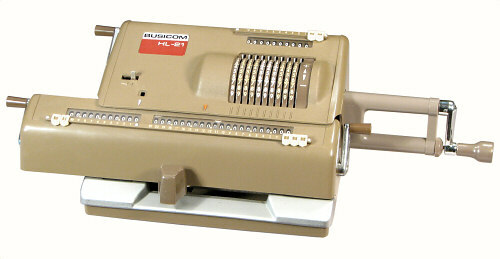 The Busicom HL-21 from the 1960s is a full-featured mechanical calculator with a setting check dial, back-transfer mechanism, and a 21-digit accumulator. The setting levers are only 5.5mm apart. The 11-digit counter register has full tens transmission, implemented using a miniature version of the pinwheel carry mechanism on the main rotor. The Technical Section on this site has illustrated descriptions of the mechanisms of several pinwheel calculators, with step-by-step rebuilding instructions for some of the more interesting models. The Original-Odhner pinwheel mechanism is typical of many of the basic machines. James Redin's web site has an illustrated history of the pin-wheel calculator industry in Japan.